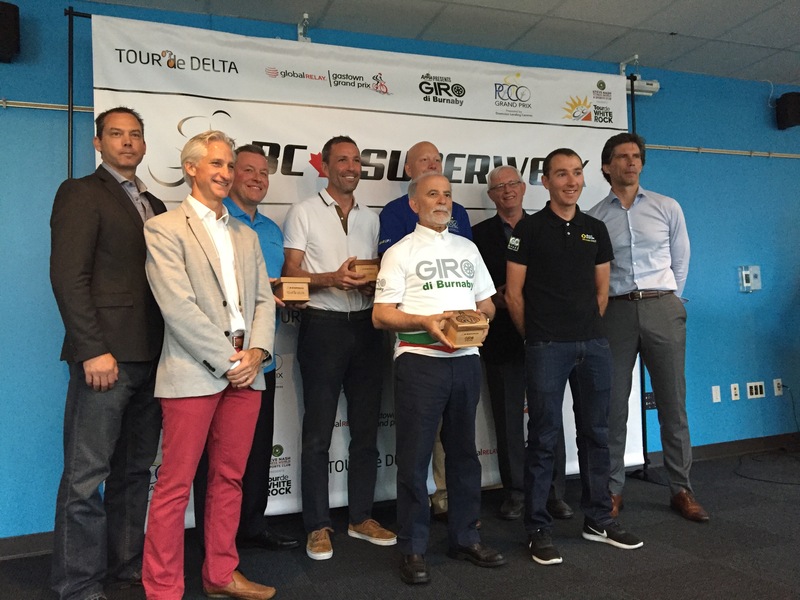 Vancouver, BC – Civic and business leaders from the five communities hosting BC Superweek races were recognized by Cycling Canada and Cycling BC on Thursday for their support, commitment, and dedication to the development of cycling. Tour de Delta Chairman Cal Traversy, Global Relay founder and CEO Warren Roy, City of Burnaby Councillor Pietro Calendino, City of Port Coquitlam Mayor Greg Moore, and City of White Rock Mayor Wayne Baldwin received special awards from BC Superweek Series Director Mark Ernsting, Cycling Canada President John Tolkamp, and Cycling BC Executive Director Jim Richards at a news conference launching this year’s BC Superweek cycling series. “We, along with Cycling Canada and Cycling BC, felt the need to recognize the leaders of each event, because without the support of local government and businesses in each race community, BC Superweek wouldn’t have reached the heights it has,” said Ernsting. In addition to thousands of hours of community resources, civic and business leaders for the BC Superweek events have invested financial resources to the tune of more than $8,000,000 over the last sixteen years.